Are you looking forward to a new comic book but it’s impossible for you to wait for its release before you know what we thought about it? That’s why there’s DoomRocket’s Advanced Reviews — now we assess books you can’t even buy yet. 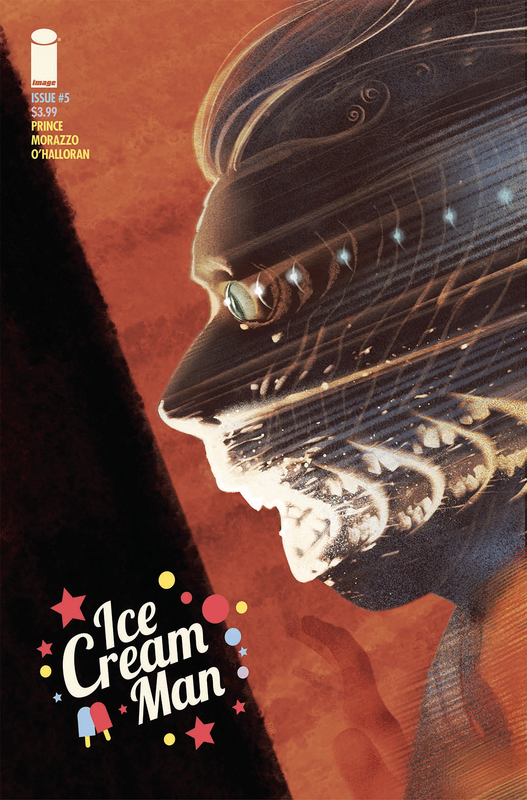 This week: ‘Ice Cream Man’ #5, out July 18 from Image Comics. THIS REVIEW OF ‘ICE CREAM MAN’ #5 CONTAINS MINOR SPOILERS. By Clyde Hall. Ever been on a summer trip with a forgettable destination? That time Mom and Dad packed you up with your 1.5 siblings for a nuclear family outing to pitch a tent and utilize the bucket outhouse for a week in Yawnderland Recreational Park? You may have nightmares and dim recollections of insectoid swarms, sunburns and the airborne, sneeze-inducing citronella twang, but the specifics evade you. Never will you ever forget, though, running into the leather-skinned septuagenarian selling nightcrawlers the day you arrived. The kitchen witch life model with gin blossoms sprouted along her bulbous nose, a soiled scarlet babushka hiding most of her straw-like but unevenly barbered hair, who set up a small table with Styrofoam coolers filled with worms near the boat dock. She with a possum on a leash and a cheekful of Copenhagen that seasoned her sales pitch to the arriving amateur fishermen. One of those times when your destination, in the parade of years since, proved less impactful than a momentary encounter along the journey. This is the same spell cast by issue #5 of W. Maxwell Prince’s Ice Cream Man. It’s Martin Morazzo’s Ice Cream Man, too, because his art style is the perfect resonance for the tales of bittersweet woe and horror Prince is spinning, and it’s been one of the constants that keeps us coming back for more. Morazzo may draft with clean and bold strokes, but he populates the panels with unflattering, utterly human characters. For stories that speak to the small, repellent Wednesdays and Pugsleys in each of us, he unloads a gallows humor with splashed gore and horrendous violence while still coaxing our crooked smiles. Each installment, Prince and Morazzo inspire me to queue my favorite Darkest of the Hillside Thickets tunes to play as I read, and I imagine a tinny, syrupy, instrumental version of each song being part of the ice cream truck’s canned playlist. Yes, their unsettling stories plague and compel and manifest like this, ghostly entities risen from the page. The first issue, though critically embraced, was as predictable as multitudes of eerie comics tales that creeped and skittered before it. And yet. There was also the sensation it was the first stray rock bouncing down from an imminent avalanche of eldritch expression. Five issues in, we’re neck-deep in the delude. And the story is one lacking in shocking destination, or even clear beginning. Yet the clash of images and unforgettable narrative constitute most of what we’re to experience and take away. Which is a twistedly funny, mind-numbing, reality-bending grief parade. Again, the start is vague. A businessman named Bill takes an express elevator from the roof to the ground floor of a 100-story office building, without the elevator. He mentions a monstrous buzzard appearing (to pick the bones of the company?) and partial conversations regarding backpay and regrets make it sound as if there is a downsizing or Chapter 7 process prompting the chaos, including Bill’s swan dive. From there, the reader is swept along to witness small scenes, some merely glimpses through windows, of the surreal and supernatural turn the corporate demise has taken. We track one employee named Veronica, as she desperately tries to exit the building and leave the insanity storm behind. But we’re also treated to dark musings of the Ice Cream Man, that unlikely horror host who takes an active part in the stories he relates, and who is presumably the were-vulture. We’re also treated to a second scoop of the kindred being from last issue, the stranger of dark raiment who may be the Ice Cream Man’s opposite number. At the very least, Anti-Ice Cream Man is onto whatever twisted game the host’s up to and possesses paranormal clout sufficient to undermine him. Even the Ice Cream Man’s narration isn’t safe. For Bill, like the reader, the eventual destination of the saga is predetermined. It’s the terror and trepidation along the way that thrills with intriguing visuals, murky dissections of the human psyche, and Prince’s finely tuned sense of horror. Some readers may find the overall pace of the series stunted, though it’s difficult to fathom impatience with this road trip, punctuated as it is with sideshow attractions and oddities of such baleful beguilement. There’s a much vaster story than the reader is currently privy to, but watching the spidery scripter weave his web transfixes us, and we want to get closer, to see more of the pattern revealed with each forming strand. Even if that means we eventually witness it from the fly’s point of view. Written by W. Maxwell Prince. Letters by Good Old Neon. ‘Ice Cream Man’ #5 hits stores July 18. 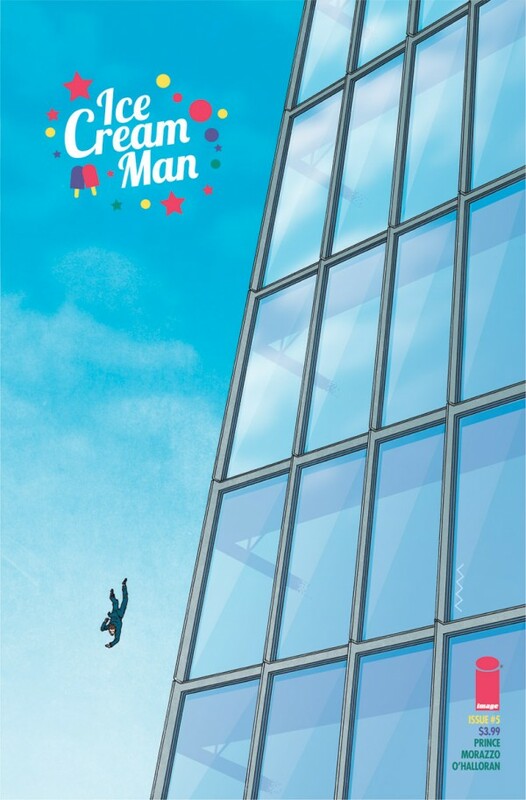 Check out Frazer Irving’s variant to ‘Ice Cream Man’ #5, courtesy of Image Comics!